Last weekend was the Travis County Master Gardener Association's garden tour, which I've been looking forward to since the last tour eighteen months ago (they plan it that way to alternate between spring and fall gardens). This year's tour featured edible gardens -- not necessarily traditional vegetable gardens, but mixing veggies in with other kinds of plants in the garden. I love this brick walkway. These square beds edged in stones are so simple! This horseshoe shape may be appearing in our yard...someday. We'd never seen this fun fall plant before (Gregg's mistflower), but it was everywhere. Apparently butterflies like it, too. 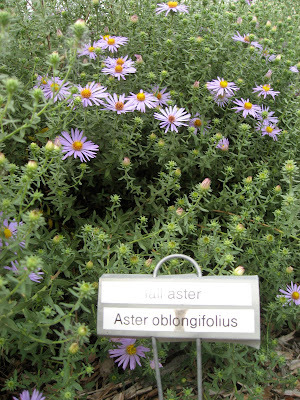 Although our weather lately has been confusing a lot of plants, the fall aster seemed to know it was autumn. 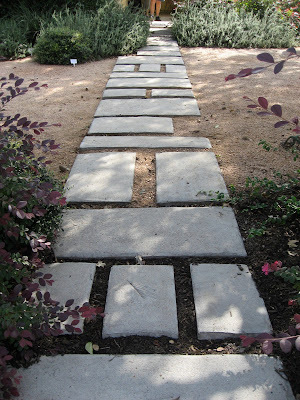 I hope our front walkway turns out as well as this one. One of the stops on the tour was the Travis County Master Gardener offices. Among all of the interesting plants and veggies they have growing (including the stone-edged beds above) was this lacey oak -- the same variety we planted in our front yard. 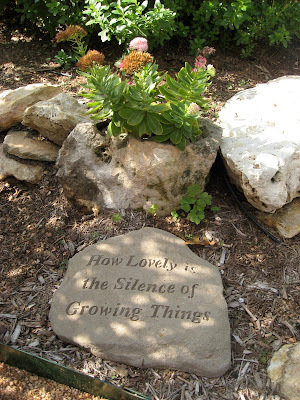 ...and yes, the silence of growing things is lovely, indeed. Neoplastic walkway. I like that.